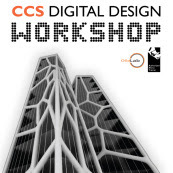 Join the DS Design Lab at their upcoming workshop. The CCS Digital Design Workshop is focused on giving a first approach to digital and parametric design to architects and designers. During the three days, participants will learn the Rhino basics as well as getting an introduction to Grasshopper. Come prepared to learn! For details, please contact the DS Design Lab team.